If you’re heading to New Zealand on your next cruise, make sure Tauranga is one of the destinations on your list. This city provides access to the Bay of Plenty, a very popular area amongst New Zealand tourists. Take a look at our cruise deals visiting Tauranga here, or read on to find out what you’ll see and do while you’re there. Tauranga is the largest city in the Bay of Plenty, one of the most picturesque regions in all of New Zealand. Tauranga itself is a fast-growing city but it provides easy access to various tourist spots, most notably the beach town of Mount Maunganui. 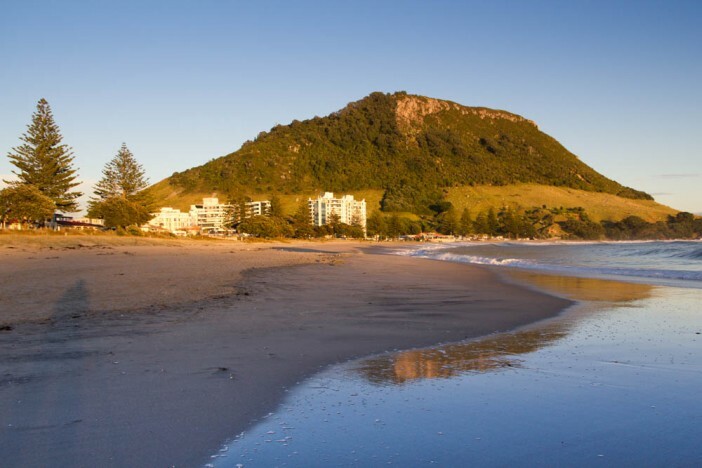 Mount Maunganui is more commonly known as ‘The Mount’, and it features large stretches of beach including a sheltered bay and a fantastic surf beach. The geologists amongst you will enjoy the sight of Mauao, the dormant volcano that overlooks the town. It provides walks of varying difficulty for enthusiastic trekkers. Those who reach the top will be rewarded with a visit to an ancient fort site. Downtown Tauranga is definitely worth exploring, with various places of historical interest on a scenic walk. The Strand waterfront features a range of restaurants, cafés, pubs and clubs. Off the harbour you’ll be able to take part in various activities, including fishing, sailing, diving and even dolphin tours. The nearby Kaimai Mamaku Forest Park features 300km of tracks through beautiful fauna – a stunning place by all accounts. You can check out the latest deals on cruises visiting Tauranga on our New Zealand cruise deals page. We regularly update our offers, so check back soon if you can’t find something you like. Your cruise begins at Sydney and visits Melbourne, Milford Sound, Doubtful Sound, Dusky Sound, Dunedin, Akaroa, Wellington, Tauranga, Bay of Islands and Auckland, where you’ll stay in a hotel before your return. This cruise begins with a flight to Auckland, where your cruise begins. From there you’ll cruise to Tauranga, Gisborne, Wellington, Akaroa, Port Chalmers, Fjordland National Park and Melbourne. This cruise departs from Sydney and visits Milford Sound, Fjordland National Park, Port Chalmers, Akaroa, Wellington, Picton, Napier, Tauranga, Auckland, Bay of Islands and back to Sydney.